Eyedropper-filling pens were simple and reliable, but there was always some risk of leakage at the joint between section and barrel. Not every fountain pen user took care to clean the threads regularly, so even if there was no actual leakage, enough ink could end up in the joint to leave the fingertips stained where they gripped the seam. Various solutions were marketed, though none came close to displacing the conventional eyedropper. Probably the most successful was the middle-joint eyedropper, shown above, covered by US patent 619,702 of 1899 (application filed May 26, 1897). To fill, the barrel would be held nib upwards and unscrewed in the middle. The lower part of the barrel would then be filled in the usual manner, and the forebarrel then screwed back into place. This design works quite well, as the mouth of the lower barrel's ink reservoir seals tightly against a shoulder inside the forebarrel. Were there to be any leakage there, the path to the pen's exterior is much longer than on a conventional eyedropper, while the joint is located away from the points at which a pen is normally held. Middle-joint pen production was centered in Boston, and was dominated by A. A. Waterman and Sterling. 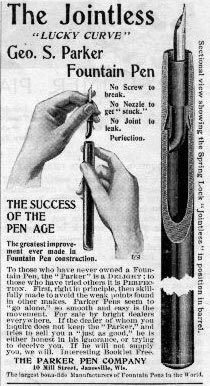 Contemporary but significantly less common is Parker's "Jointless", illustrated above in an 1898 advertisement, and patented in 1899 as US 622,256. The name was accurate, in that the barrel was one-piece, with a section assembly that fit into its end like a cork stopper. Any leakage past the stopper was kept within the confines of the nib opening and away from the fingers. The problem with the Parker Jointless, however, was that one had to grip the nib and feed directly in order to open the pen and fill it -- so while you might not get your fingers inky in use, you likely would when it came time to refill. Another design that is closely related to the middle-joint, but which has received much less collector attention, is the Eagle end-joint. Marketed as the "Correspondent", it was made under US patent 599,591, awarded in 1898.